We had the honor of spending an evening with three lovely plant-based ladies last weekend on our getaway to Austin. Since it was pouring rain and our plans to eat at the only whole foods, oil-free restaurant in Austin were waylaid, one of the ladies (Jill of Simple Daily Recipes) invited us to come over for an impromptu cooking session/dinner. She had all of the ingredients to make minestrone soup, so that's what we made! Along with Patty's fresh dinner salad and fruit salad and Jill's cornbread, a delightful meal was born! After we returned home, I knew this would be our lunch soup for the next week. I tried to remember what we put into the pressure cooker so I could recreate it. Here's what I came up with and it was FABULOUS once again! This one will be a new staple in our home. Place the chopped onions, carrots, and celery in the pressure cooker and cook for 5 minutes on the brown or saute feature (stirring occasionally). Add the rest of the ingredients EXCEPT for the pasta. Set to pressure for 3 minutes. While the soup is cooking, boil your pasta, drain, and set it aside. Allow the pressure cooker to cool down before releasing the top. This soup can sit on warm for several hours before serving, so you can make it in the morning and leave it to serve at lunchtime. Serve the hot soup with desired amount of pasta. NOTE: This soup could easily be made on the stovetop or in a slow cooker. 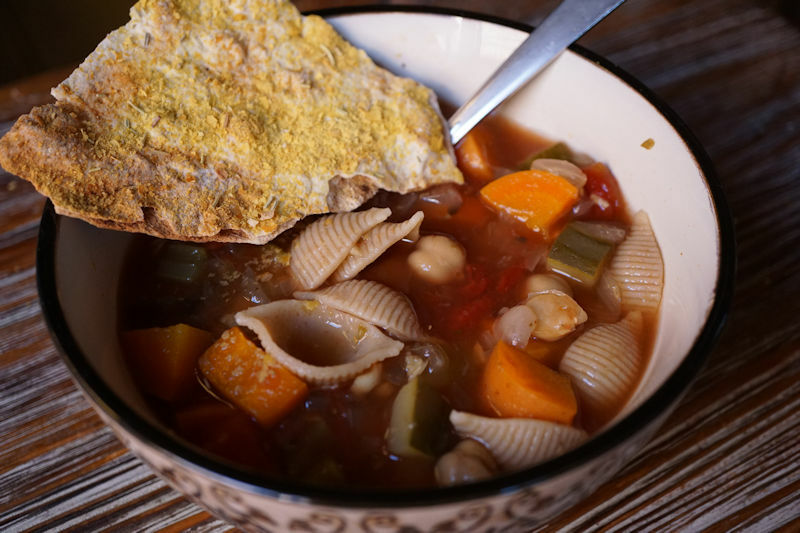 It is a versatile soup that only gets more delicious as it sits over low heat.